Following the one-day Glass event which allowed a select few to purchase Google Glass, the company has made their wearable tech publicly available to all in the US. Most people who were interested in buying Google Glass have probably already snagged an invite by now, but having it on sale to the general public is an important milestone. At a somewhat high $1500 cost, you the Glass itself along with a cable/charger, mono earbud, pouch, and your choice of free shades or prescription frames. Keep in mind this is the same device Explorers have been using for the last year, so the only thing that's new is that you can buy it without an invite. 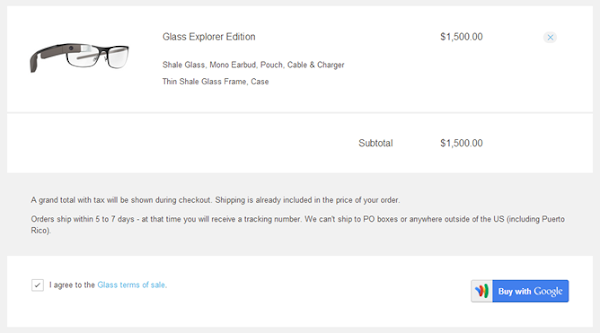 An updated version of Glass is expected at some point, but that might still be a way off with the Explorer Edition price unchanged. [UPDATE] As of now it looks like the Google Glass is out of stock and no longer available for purchase... Stay tuned for further updates.